This week is a simple Grilled Asparagus side dish that also makes a great addition to salads! This one features our Lemon Garlic Pepper! 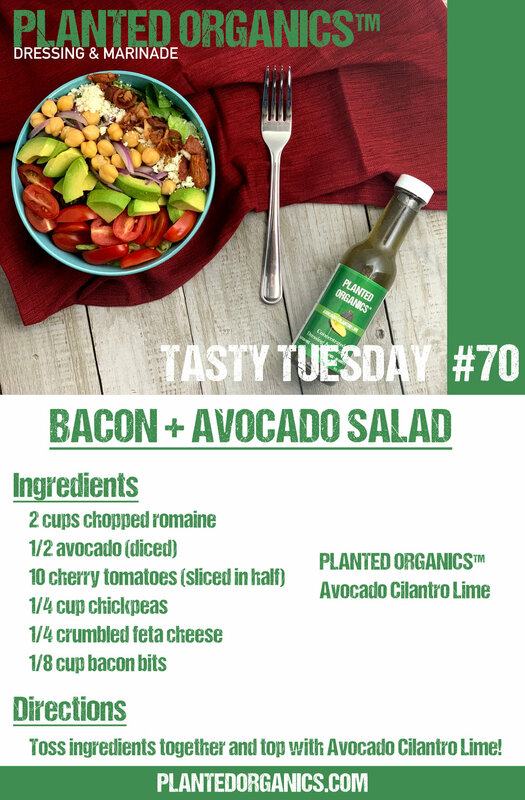 This week is a Bacon + Avocado salad! This one features our Avocado Cilantro Lime! The great burst of lime with this salad is the perfect combination! Enjoy! This week is a Kale-bouli salad! Inspired by the original mediterranean dish, this remixed salad is also gluten free! Starring our Lemon Garlic Pepper dressing, this salad packs a punch! 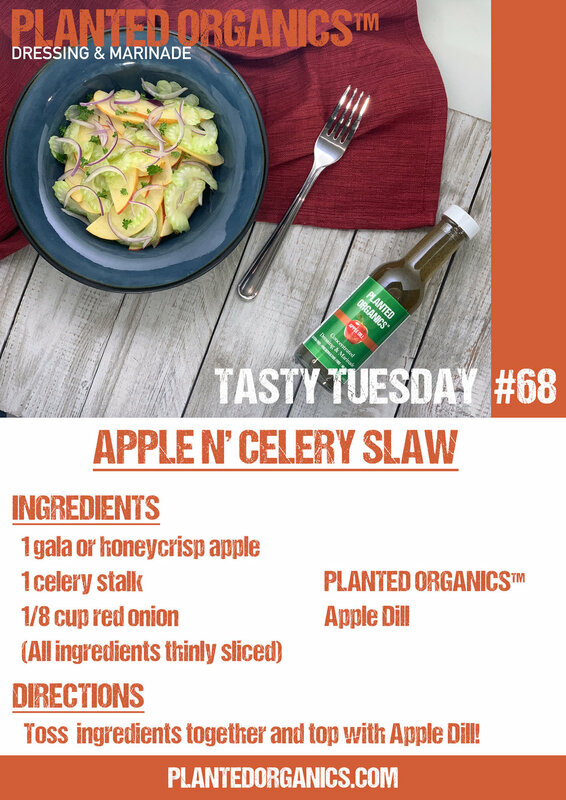 This week’s Tasty Tuesday is Apple N' Celery slaw! Our Apple Dill dressing paired with the crisp freshness of celery makes the slaw the star of the party! 2/26/18 - This week’s recipe is a simple Pear + Bleu salad! The brightness of Orange Sage pairs perfectly with bleu cheese! Hope you enjoy! 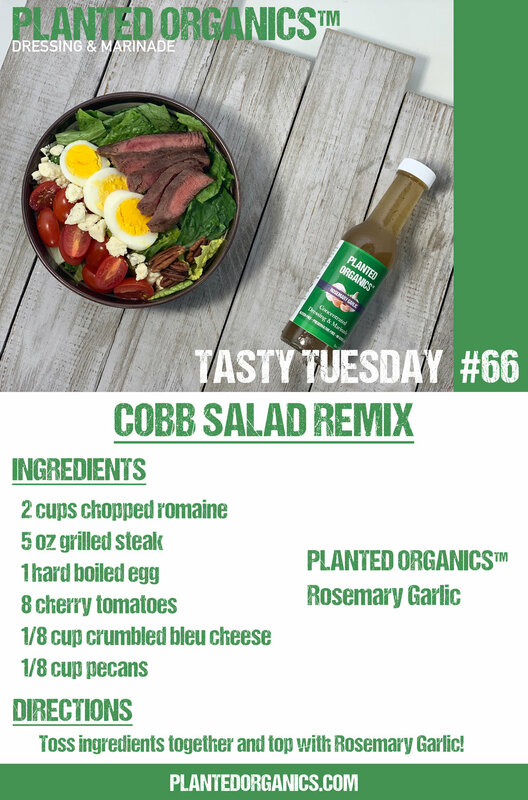 This week’s Tasty Tuesday is a Cobb Salad Remix! With steak and eggs how can you top that?! Our Rosemary Garlic dressing ties it all together for a great dish! This week is the first of our Jazz it Up! salads. Here we take a pre-packaged salad mix readily available at any local grocer, add a few ingredients and make it shine! Enjoy! 2/5/19 - Baby Arugula + Sun-dried Tomato Salad! This week is a super easy salad. It features hearty sun-dried tomatoes and savory mozzarella cheese. Paired with our Raspberry Oregano dressing, it can’t be beat! This rice bowl is sure to impress! Featuring our Coconut Ginger its tough to beat!